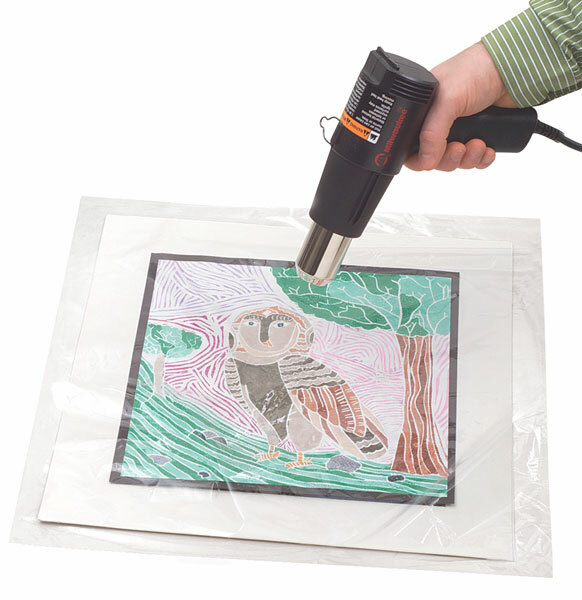 This shrink film, made of archival grade polyolefin, provides archival protection to your artwork, and makes a distinguished professional presentation. Use Shrink Film with a heat sealing system like the Mini-Wrap Shrink Packager. An "archival" grade polyolefin is not only acid free. It contains no plasticizers that can react with pigments and dyes in the work of art, or in its substrate. Graphics and Standard Grade shrink films are center folded on the roll. Dimensions noted below give the width of the roll itself; the film is twice that width. Standard Grade — 75 gauge archival quality polyolefin. 100 ft (30.5 m) roll. Economy Grade — This shrink film is not archival and not center folded. The width given is the width of the film. 500 ft (152.4 m) roll. Graphics Grade — Tough 100 gauge archival quality polyolefin. 100 ft (30.5 m) roll. Use the tougher graphics grade in situations where the shrink-wrapped piece may be handled a great deal prior to sale. ™ Mountex is a trademark.™ Mountex is a trademark. Archival grade shrink wrap films are not themselves designed to be an archival storage system. We recommend archival grade shrink wrapping with fine art because, once a work of art is sold, it is no longer under the artist's control. Many customers store a newly purchased work in shrink wrap for months or years before they finally open it and display it.